KATHMANDU, Jan 20: Prime Minister KP Sharma Oli is to leave for Davos of Switzerland later today to participate in the conference on Annual World Economic Forum. 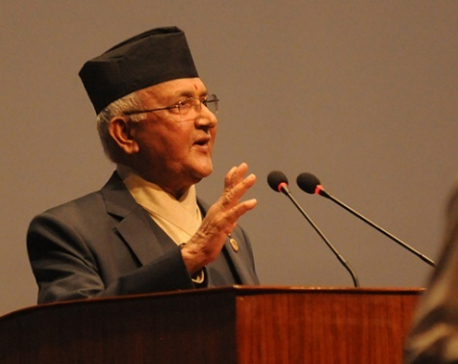 Prime Minister Oli is departing for Davos at 8 pm from the Tribhuvan International Airport. Leading a Nepali delegation, the prime minister is going to visit Switzerland from January 22 to 25 to take part in the conference on Annual World Economic Forum. Apart from attending the WEF Annual Forum, Prime Minister Oli will hold meetings with leaders from various countries including Vietnamese Prime Minister Nguyen Xuan Phuc and Prime Minister of Israel Benjamin Netanyahu, Swiss President Ueli Maure and World Economic Forum President Børge Brende on the margins of the conference. The WEF's conference will be attended by the chiefs of government from across the globe. Oli is going to be the first head of government from Nepal to address the forum. 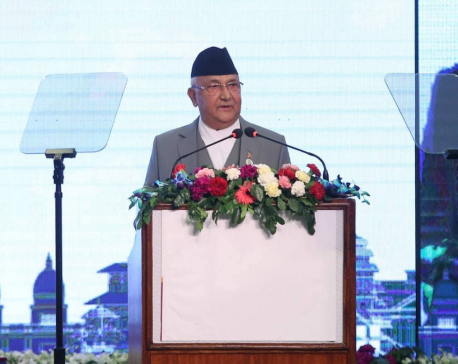 Prime Minister Oli will speak during the two sessions titled "Strategic Outlook on South Asia" and "Shaping the Future of Democracy, according to a press release issued by Ministry of Foreign Affairs. Leaders from the G20 member states, who take part in the conference, are also scheduled to hold a separate group meeting with Prime Minister Oli. Oli will be accompanied by his spouse Radhikar Shakya, Minister for Foreign Affairs Pradeep Kumar Gyawali, Finance Minister Yubaraj Khatiwada, Foreign Secretary Shankar Das Bairagi, Chief Political Advisor to Oli Bishnu Rimal, Foreign Relations Advisor Rajan Bhattarai, among other officials. The annual meeting of the forum, which is an independent international organization for public-private cooperation formed to improve the state of the world, is being held in Davos-Klosteet to focus on the theme of ‘globalization’. Concluding his week-long visit, Oli will return home on Jan 27. Leaders and luminaries including Sir David Attenborough, Shinzo Abe, Angela Merkel, Prince William and Jacinda Ardern will gather in Davos for the event, according to a press release issued by the WEF. They’re among around 3,000 participants drawn from all over the world and from every sphere of influence: business, government, civil society, academia, arts and culture, and media.